From its founding, NGINX has focused on building software to help the next generation of digital businesses develop and deploy their applications with the utmost performance, reliability, security, and scale, and has done so with the support of a vast community of open source users. We are proud to announce that Gartner has recognized NGINX’s strengths in both its Gartner Magic Quadrant for Application Delivery Controllers1 and Gartner Critical Capabilities for Application Delivery Controllers2 Reports for 2016. With over 170 million sites and applications using NGINX, we are at the forefront of this industry shift. Our users are moving away from hardware and traditional approaches toward flexible and scalable solutions for modern applications, many of which are deployed in the cloud or hybrid environments. Our experience helping the most innovative companies succeed in this ever‑changing environment has allowed us to create sophisticated and rapid‑to‑deploy software to best match the needs of the modern web. Our offering is developed with feedback from our community of millions of users and through direct feedback from hundreds of NGINX Plus customers. NGINX Plus further extends the open source NGINX capabilities with advanced features and award‑winning support for a truly enterprise‑ready solution. 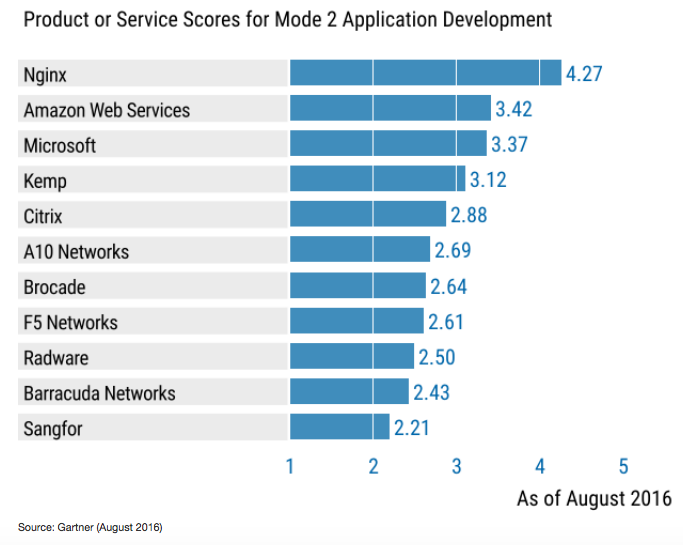 In our first‑ever entry in the Gartner Magic Quadrant, we’re delighted to have received the highest scores in the Critical Capabilities report for the Mode 2 Application Development and Mode 1/Mode 2 Hybrid ADC use cases. We interpret “Mode 2” as innovative and fast‑changing applications which are often developer‑lead, whereas we refer to “Mode 1” for predictable, unchanging deployments such as off‑the‑shelf enterprise applications. The growing shift towards modern Mode 2 application development is becoming mainstream in the enterprise as organizations are seizing the opportunity to transition to the modern web. 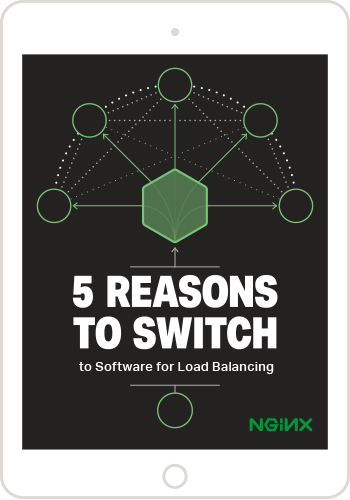 This evolution in the development process inevitably favors companies that offer software‑based and application‑native load balancing tools like NGINX. Furthermore, one of Gartner’s key findings in the Critical Capabilities Report indicates that “by 2019, the hybrid Mode 1/Mode 2 use case will become more important, as enterprises seek to bridge the requirements between these two work styles”. Open source vendors are playing a crucial role in driving the performance, reliability, security, and scale of modern‑day applications. The ADC market is another great example of open source gaining tremendous clout and market share by offering a more focused and lean solution to load‑balancing tooling. The ability to innovate faster and offer a more agile product is disrupting the ADC market, and helping it to grow alongside today’s digital businesses. NGINX Plus matches the performance and most popular capabilities of hardware ADCs with cost savings of up to 75% over legacy competitors. By moving to NGINX Plus’ software‑based ADC, customers are also unlocking flexibility that hardware appliances can’t provide since NGINX can run anywhere: bare metal in your private data center, in public or private clouds, and in containers. 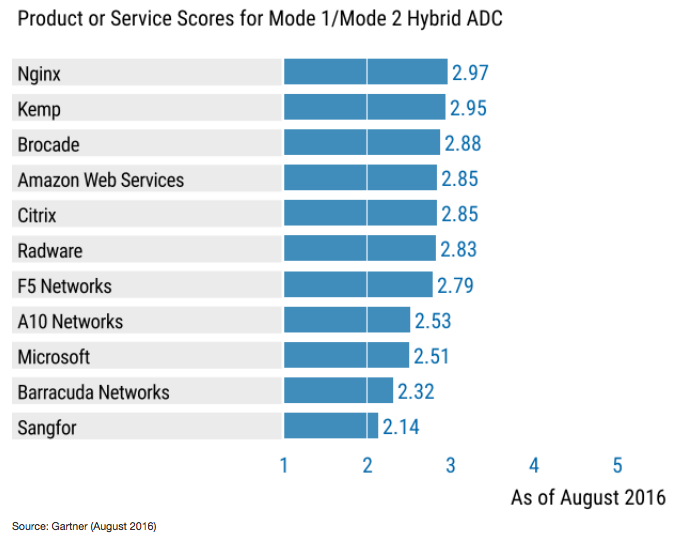 We’re incredibly proud to be recognized as top vendor for the Mode 2 Application Development and Mode 1/Mode 2 Hybrid ADC use cases, and as a key player in the Magic Quadrant. We believe this puts us at the forefront of the growing application delivery trend toward flexible, high-performance load balancers for modern environments. We look forward to celebrating our continued success with our team, and with current and prospective NGINX users during this year’s annual user conference, nginx.conf 2016, which kicks off tomorrow, September 7, in Austin. This graphic was published by Gartner, Inc. as part of a larger research document and should be evaluated in the context of the entire document. The Gartner document is available upon request from NGINX, Inc.